Known as “the man who broke the Bank of England,” George Soros (born Gyorgy Schwartz) is a Hungarian-born American citizen, investor, author, political donor, and philanthropist. After escaping totalitarian rule in Hungary, Soros used his survival experiences to acquire wealth through hedge funds and other financial vehicles, becoming one of the richest men in the world. While his original philanthropic and political focus was former Soviet-bloc states, Soros now advocates for regulations intended to reduce market instability in the United States. Soros is one of the United States’ top donors, spending billions on campaigns, think tanks, start-ups, and nonprofits that promote his agenda. After escaping Hungary, Soros moved to England to attend the London School of Economics in 1947. No longer facing the threat of war, Soros found life in London to be dull, became fascinated with the teachings of the philosopher Karl Popper and dreamed of one day becoming a famous philosopher himself. Soros was dissatisfied, however, because he had trouble finding an audience to hear his philosophical musings. Because he was a native speaker of the barely spoken, constructed international language, young Soros boarded with the London Esperanto society. Having finished his exit exams one year early, Soros spent the remainder of his studies under the tutelage of Popper and started developing the groundwork for the theory that would become the focus of his life, his theory of “reflexivity”—his explanation for why markets can at times “tend toward excesses” rather than equilibrium. After what he describes as “a few false starts,” Soros found work in the currencies exchange in London and eventually moved to New York City in 1956, where he became a financial worker specializing in European markets. In 1963, the Interest Equalization Act effectively ended purchases of foreign securities, which in turn put an end to the analyst niche in which Soros had specialized. Subsequently, Soros took three years off to write a book about his philosophies, which he felt would eventually give him an edge in the market. In failed efforts to test his theories, Soros grew increasingly detached from the market, gave up on the book, and decided not to publish it. Instead, he got back into stock trading, taking a job at a hedge fund in New York City. At first, he found difficulty in adjusting to corporate American culture, and claims that the only reason he was able to land the job in the first place was because one of the managers was also Hungarian. Soros found a better fit with the company once he began bringing in profits, and his employer helped start Soros’ own investment vehicle after three years. Over the years, Soros’ hedge funds have gone through a series of name changes and various incarnations, with Soros Fund Management and the Quantum Group of Funds being the most well-known. With the help of Stanley Druckenmiller, Soros’ Quantum Group of Funds engineered and executed trades dealing with billions of dollars per day— not without controversy. By the time of its closing, Soros’ Quantum Fund generated a yearly average return for investors of 30 percent. In 2011, Soros shut down the fund after the implementation of the Dodd-Frank financial regulation law, but returned to the market with a privately-owned family-office. While Soros uses the term “political philanthropy” to describe his programs that combine politics with philanthropy, he has said that “people should separate their role as market participants from their role as political participants”. In January 2018 Soros called the digital currency, or cryptocurrency, a “bubble” because digital coins are too volatile to function as reliable currencies. On April 6, 2018, however, it was announced that Soros Fund Management had received “interal approval” to trade in cryptocurrency. 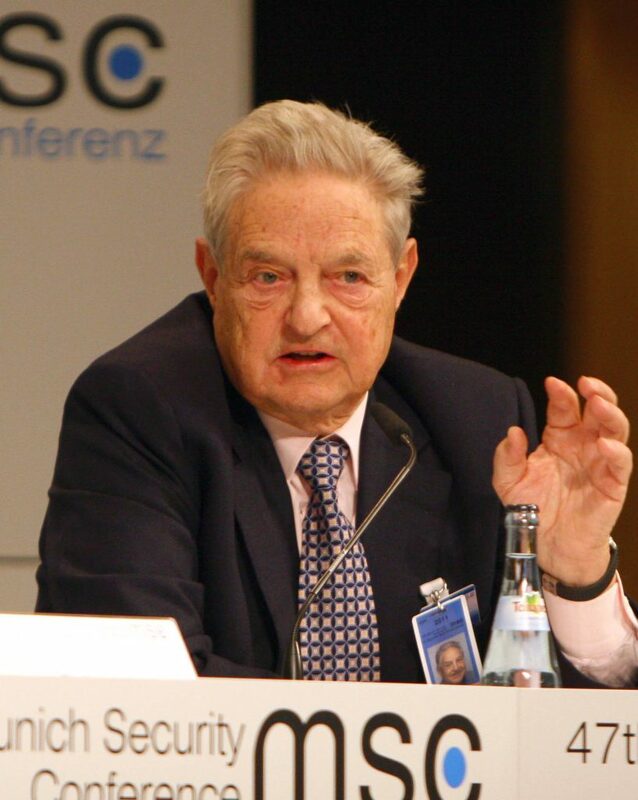 In 2009, Soros claimed to be able to separate his political ideology from his investment practices, saying, “I have practiced what I preach.” But, while in 2010, Soros said that gold was “the ultimate bubble,” in the spring before the 2016 presidential election, Soros followed the lead of his former hedge-fund manager, Stanley Druckenmiller, and invested in gold, while divesting from financial markets. After the 2016 election, a stock rally ensued, boosting the Dow Jones Industrial Average over 19,000, and Soros lost nearly $1 billion because of his bearish positions. Soros has spent more of his money on what he calls “political philanthropy” as he has grown older. In 2011, Mr. Soros’ Open Society Foundations spent $835 million, intended to “promote the values of open society, human rights, and transparency,” and spent another $185 million in 2013. All in all, Soros claims that he has, “given away over $12 billion to date.” Some of Soros’ philanthropic projects are for-profit; in 2016, Soros pledged $500 million for economic programs to help refugees, mostly in Europe, where he planned to help start-ups and establish businesses owned by migrants. Now active in 70 countries, Open Society Foundations (OSF) was founded in the early 1980s and had the intention of propagating democracy and post-Communist prosperity in former Soviet-bloc states. Financial ties between the Black Lives Matter movement and Soros have been reported, as well as financial ties to Occupy Wall Street through intermediaries like the Tides Center. The network of Soros funded organizations indirectly touches 30 media organizations. The day after the 2017 presidential inauguration, the “Women’s March” took to the streets of Washington, D.C. Between 2000 and 2014, Soros donated to 40 of the groups affiliated with the march, his donations totaling at least $89.9 million. George Soros spent over $18 million on political campaigns affiliated with the Democratic Party in 2016, $24 million on left-of-center Super PACs over the last few years—including $7 million on Hillary Clinton’s primary PAC, Priorities USA—and partnered with other donors in a $15 million campaign to mobilize specific demographics. In 2013, Soros had agreed to become co-chair for the Clinton-aligned Ready For Hillary Super PAC, as well as investing over $2 million in a left-of-center data analytics company, Catalist. After Hillary Clinton’s defeat in the 2016 Presidential election, Soros met for three days with elite donors and Democrats to come up with new plans. Soros also spent $2 million in 2016 to help defeat then-Maricopa County Sheriff Joe Arpaio (R) as part of a nationwide push for criminal justice reform. In the 2012 election, Soros announced that he would contribute $1 million each to the voter mobilization group America Votes and the Democratic super PAC American Bridge 21st Century. According to the Center for Responsive Politics, Soros gave American Bridge 21st Century $2 million in the 2015-2016 election cycle. The Open Society Foundations and the Central European University were created by Soros to provide a platform for his ideology. Soros is also involved in groups such as Global Witness, the International Crisis Group, the European Council on Foreign Relations, and the Institute for New Economic Thinking. Through the Open Society Foundations Soros donates to a number of left-of-center organizations, including the Center for American Progress, a policy think-tank that was formed by Hillary Clinton’s former campaign manager, John Podesta. Soros was one of the early supporters of then-Senator Barack Obama in his first presidential run, after Soros failed in his 2004 backing of then-U.S. Senator John Kerry (D-Massachusetts), to whose mobilization efforts Soros had donated $27 million in an attempt to defeat President George W. Bush. In his 1987 book, Soros said, “I opted for Open Society, but the choice was not without qualification”. His qualm was that, “each form of social organization was found wanting in something that could be found only in its opposite: totalitarian society lacked freedom; Open Society lacked stability.” Soros says he was drawn to Karl Popper’s term “open societies”— societies wherein free exchange of ideas is allowed— after experiencing totalitarian oppression by both Hitler’s Germany and Soviet Russia in World War II-era and early Cold War-era Budapest, Hungary. In June 2018, Soros expressed his disappointment with U.S. Senator Kirsten Gillibrand (D-NY) for pressuring disgraced Sen. Al Franken (D-MN) to resign office following allegations of sexual harassment and assault. In return, Gillibrand’s supporters accused Soros of sexism.